Something foul is afoot. We're not sure what it is, but we know Z-Country Paradise doesn't like it. And we expect they plan to do something about it. Or maybe they're behind it. It's too soon to tell. Either way, something sinister surrounds the four men and one woman who comprise the populace of Z-Country. They observe us, but they are not us. 16 pages of photographs tell the story of this amazing live performance in Lisbon, Portugal. 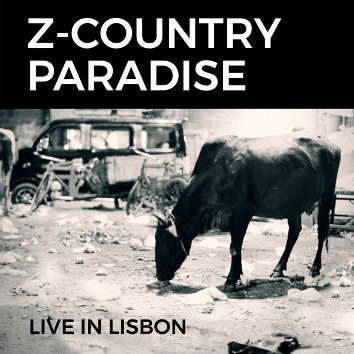 Z-Country is art punk, post punk, post art, bluesy here, a shuffle there, even a bit of highlife jive. Any groove they get into is incidental. This is message with a music, some new horror with a hint of a happy ending.